This being stuck just doesn’t hold water. Frustrated and bummed about it, I missed a real opportunity. Well, not missed but most seriously delayed. So on the surface it looks like no RV park or State Park or what-have-you is open in Pennsylvania or northward until May 1st, right? Well, not quite true. Its rather amazing how the mind works when ones doing mundane things like filling the water tank. First let me say… there’s alot available if I wanted to move every day, truly there is. But neither I nor my cats like moving everyday for more than 3 days. The calendar tells me I got a little over 2 weeks to play with before my next adventure. So even attempting to plot and plan this to any degree did not quite fill up that 2 weeks. So I tossed that idea. I made one phone call this morning on a hunch. It was to a RV park further north of me that claims its not open until the end of April. All reviews state this is a good place. So I asked if I could help get there park open. I told them a little on what I had done camp hosting last summer, and I had no plans to get back into that this year, but I need a place to park until such and such date and what I’ve done before. We chatted a bit more and they said they would talk it over and get back to me. Not 20 minutes passed, phone rang. If I could come in next Monday, the day after Easter, they would love to have some help. They outlined what they were seeking and what they were offering.. it doesn’t sound like much on the work part, but will reserve that opinion until I get there. But yippee!!! I got a place to hang until May. It was chilly this morning – high 20’s, and it snowed last night but didn’t last long. And it was a hot 52ºF this afternoon, well in the sun it was toasty.. and that prompted a different subject. I don’t know how my fellow full-time RVer’s keep plants going in their RV, but it has been a challenge for me. 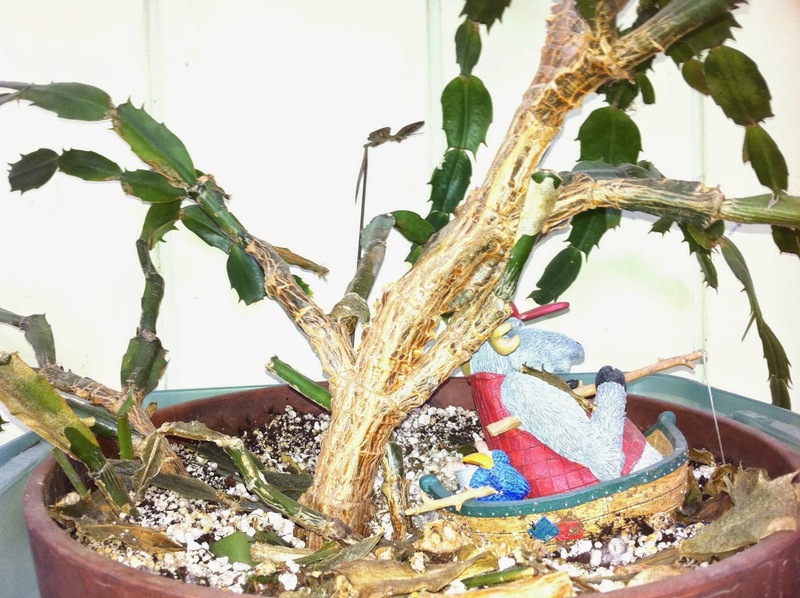 A couple of pictures here are off springs to the Grandmother Christmas Cactus. I say Grandmother of all, as when I carried this huge plant on my lap out of Adak, Aleutian Island, Alaska back in 1994, it was 18 years old then.That was a long airplane ride with that plant on my lap. I acquired it from a civilian gal who acquired it in the Philippines before Adak. That Grandmother cactus has thrived in the northern arctic entry of my house for all these years, and it went outside in the summers sitting on the front porch facing north. Then I moved to Haines and I realized it was way-y-y too big to carry in my RV, so found a nursery to maintain it over the winter until I got back. The first picture below, I had planted this arm off the main plant – it was just as big as the plant back in 1994 when I handed it to the gal at the nursery in 2012, when I returned in the April 2013 (check my previous blog posts on this saga). When I finally got it out of her, this is what I was given. The soil was so saturated with red water – it took months for it to dry out… while waiting for that (at a friends house) it bloomed one last magnificent time, then died. After all these years… I can’t believe she is gone. She made many, many people happy as she bloomed several times each year. Well, this little cutting in this yogurt cup is the last off spring of the Grandmother’s plant. I got this in June of 2013 when I delivered the above plant to my friends house to try to save the main plant. I managed to frost bite the leaves twice this winter, lost those leaves. Norm took a chunk out of another leaf and I am proud to say… I got 2 new leaves coming on the plant. Happy, happy, happy!!! Now if anyone has a good solution to hang this on the wall, out of reach of cats, secure enough to go down the road – let me know, ok? And any tips on protecting it better in the freeze. Before I thought of asking to work at getting a RV park open for the season, I started looking at other sources that I had acquired before I went full-time. They are more fitting for me now, but I had totally forgotten about them. One is Overnight RV Parking and the other is Boondockers Welcome. The latter one I have belonged to since before my RV ownership, as I provided our home in Alaska to be a stopping point for RV travelers. Then it lapsed. So I have rejoined as of today. If I had checked either one of these, I would have found solutions and not restraints on moving forward. So it is a good day and I thought I would share these with you. For hanging a (smaller) plant, you might consider a gimballed drink or plant holder meant for boats. You may know this if you are a boater, but gimballed means that the bracket can rotate in one or more axis/axes while remaining level. And here is a really nice one that comes as part of a lamp, but I have seen people turn it into a plant holder (the lamp is atmospheric but pretty dim, so the framework gets re-purposed). These may be too small, and they are expensive, but it's also possible to make your own with the gimballed concept. And some photos of a Forespar brand “Mini galley” that is gimballed (and larger). I'm not sure they make this one any more, but probably they are available on Craigslist, etc. if not. They were a bit small for cooking (and you had to use special pots), so probably a popular item to buy, not use, and then sell later. Awesome! I remembered seeing these on boats, but did not know the word “gimbal” at all or what it meant until now. Thank you!!! That was a great plant story. Good luck keeping it going. 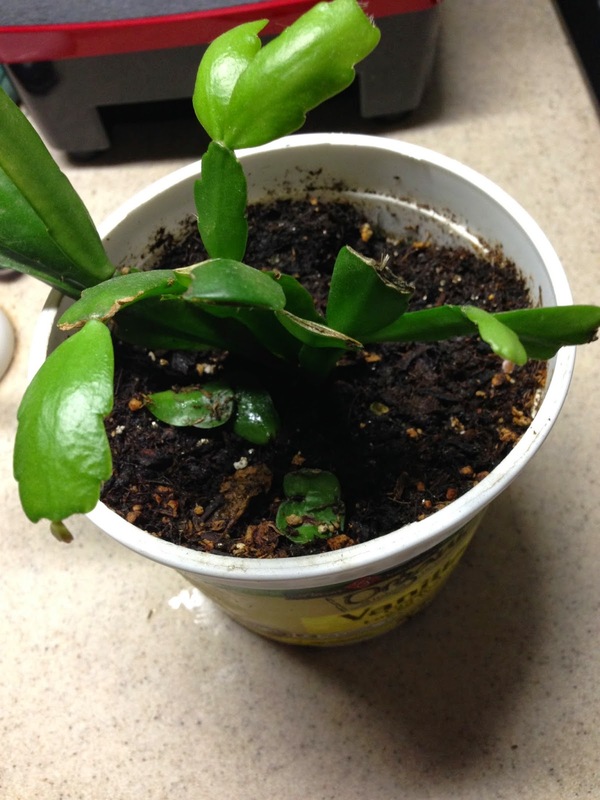 Am working on it… in the latest freeze, I lost one of my new leaves, but no damage to the main plant.